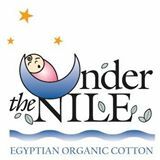 Since 1998, Under the Nile has been a leader in the organic industry, producing the softest and most durable cotton apparel, toys and accessories for infants and children. All of our products are made from 100% handpicked organic Egyptian cotton, without the use of pesticides or chemicals throughout the entire production process. At Under the Nile, we have built a philosophy based on families. We believe that the families that produce our product are as important as the families that purchase them. From the time the cotton seeds are planted, to the growing, weaving and sewing, each and every product is made with both you and our community in mind. Each person is valued for their unique talent and loving commitment to the high quality that makes Under the Nile so special. By cultivating organic cotton, we cultivate the community and the environment that make it possible. We believe that providing work, as well as education and health care, is necessary to help impoverished communities become self-sustaining. In doing this, we are keeping our promise to support our community and foster health and harmony.